Conveniently make, store, and fill your nectar feeders with help from this Songbird Essentials Self Measuring Nectar Pitcher. This fantastic piece acts as a pitcher, measuring cup, mixing spoon, funnel, and storage container at once, making refilling nectar feeders simple. A generous, plastic paddle inserts into slots on the front of the item, labeled "H" for creating hummingbird nectar and "O" for making oriole nectar. Fill the front section of the vessel with sugar, and the back section with water to the same level. This ensures the right ratio of sugar to water, and the paddle can be removed and act as a mixing spoon. Place this plastic container in the microwave to boil the water if not using an instant nectar. A molded handle makes it simple to carry the vessel to your hanging feeders, and a front spout helps you refill the reservoirs. 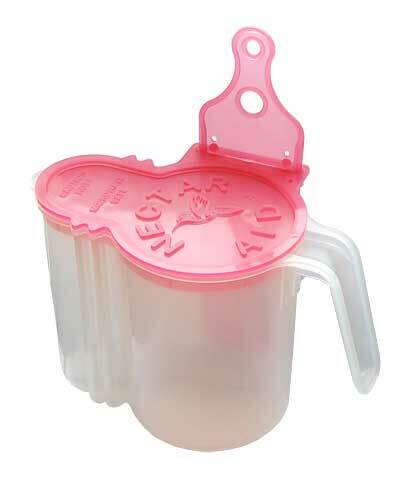 Snap the included, pink lid onto the top of the unit to store any excess nectar in the refrigerator. The clear plastic body keeps it easy to monitor nectar levels or ensure you are filling both sections evenly, and the item cleans thoroughly for use over and over again. Make filling your hummingbird and oriole feeders quick with this Self Measuring Nectar Pitcher. Made in the USA.